Welcome to our CDS community! Our children spend the largest portion of their time in school, and being involved in our parent teacher organization is the best way to stay close and connected to their everyday lives. The PTO supports CDS and its mission by promoting a spirit of community that celebrates learning and welcomes family involvement. Through the service, educational, and social events that we sponsor, volunteers can participate at many levels. The PTO functions in three different aspects: events and services related to parent/family support, activities related to teacher/classroom support, and programs and events supporting the school overall. Within these PTO functions, there are many opportunities to participate. Support for parents and families include sponsored special events such as Dads’ Day, Grandparents’ Day, the Father/Daughter Dance, and Mother/Son Bowling. We coordinate volunteer programs to help serve school lunches, conduct a school uniform exchange at the end of each year, and provide opportunities for parents to participate in community service activities affiliated with Metropolitan Ministries. 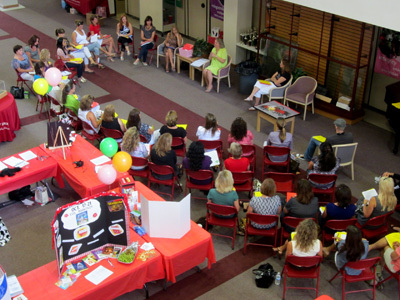 Our parent education programs offer learning opportunities such as a book club and parent-oriented presentations. Parents volunteer each year to represent the individual classrooms and provide support for the teachers and their activities. Each campus has a volunteer leader who coordinates communications and networking and facilitates parent support. Thanks to the help of parent volunteers, students are able to enjoy a full calendar of activities, field trips and fun. An essential component of the PTO is its fundraising endeavors. Volunteers dedicate their time and talents to organize our many fundraising programs and events. Featured fundraising events, including the Scholastic Book Fair, the Patriot Run (cosponsored with the CDS Booster Club), and our Annual Auction are planned, coordinated and staffed by volunteers resulting in valuable financial support for our school. A newly developed Dads Club is planning exciting activities and fundraising events for the year. Its mission is to increase every father’s involvement while providing school-wide support at all grade levels. The parent community connects with our school through its volunteers. With parent involvement, everybody wins: our children perform their best in school, our school benefits from the vital support provided by dedicated volunteers, and parents gain opportunities to build friendships with others who share a common interest in their children’s education future. We invite you to take an active part in our community. Get Involved, Be Informed and Stay in Touch.